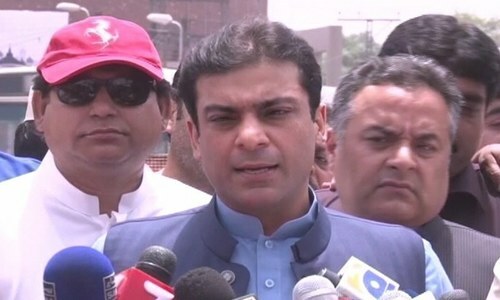 A team from the National Accountability Bureau (NAB) on Saturday returned to the Shahbaz family's 96-H Model Town residence in Lahore to arrest Punjab Assembly Opposition Leader Hamza Shahbaz. Following a nearly five-hour standoff outside the house, the NAB team returned around 4pm after the Lahore High Court (LHC) issued a short order, granting interim bail to Hamza until April 8. According to the high court's written order, ad interim protective bail has been granted to Hamza "in order to enable the petitioner to approach" the concerned bench for the hearing of a bail plea that was filed on April 4. Advocate Amjad Pervez had appeared before the high court on Hamza’s behalf. He argued that Hamza has filed a request for interim bail and if he is taken under custody, he will lose his constitutional right to appear before the court in order to secure bail. LHC Chief Justice Sardar Shamim Ahmed summoned the record of the appeal filed for interim bail and barred NAB from arresting Hamza meanwhile. After the NAB team left Model Town, Hamza appeared before emotional supporters and said that "the LHC had said that Hamza has been cooperating with the anti-graft watchdog and there was no need for arresting him." He thanked his supporters for standing before NAB's team like an "impenetrable wall" as if they were protecting their own house, adding that "these are not PML-N workers, they are my family." The PML-N lawmaker then pointed his guns towards the government and said that the prime minister should "stop lying and acting out of jealousy and bias". "Pakistan's economy is drowning, we don't have money for debt servicing. I ask them (government) to draw a road map to fix the economy and provide relief to the poor. People are tired of hearing [about] 'thieves'," Hamza said. The development came just a day after NAB conducted a failed 'raid' at the same address to arrest Hamza on charges of money laundering and possessing assets beyond means. NAB officials had earlier said that they would not enter the house and that the PML-N leader should turn himself in. However, the accountability watchdog had also petitioned an accountability court seeking permission to enter the house to arrest Hamza. 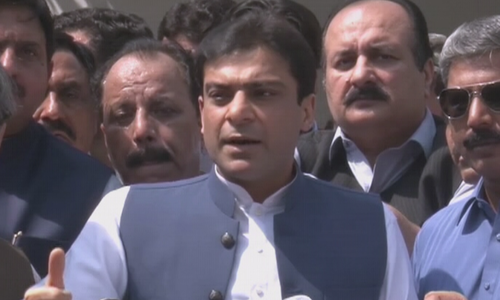 "We mean to arrest Hamza Shahbaz by all means today," the NAB deputy director leading the team had told the media. 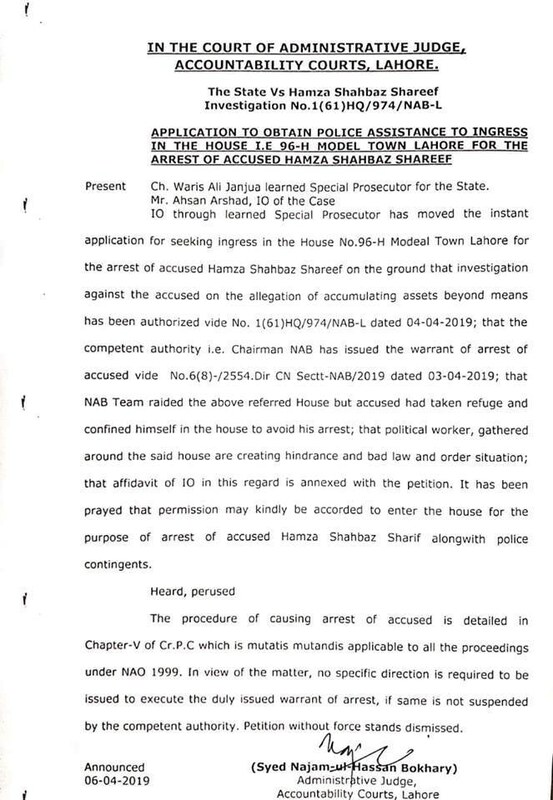 After the accountability court issued its decision on the matter, PML-N counsel Atta Tarar, while commenting on the order, stated that the court had "dismissed" NAB's petition and refused to give NAB and police permission to raid the house to arrest Hamza. He said the arresting party should, therefore, turn back. However, while the accountability court had, in fact, dismissed the petition, it had made clear that it was only doing so because NAB already had all authority it needed to execute its arrest warrant in line with Chapter V of the Code of Criminal Procedures. The court said that "no specific direction is required to be issued to execute the duly issued warrant of arrest if same is not suspended by the competent authority". Speaking to the media after the LHC stopped NAB from arresting Hamza, PML-N spokesperson Mariyum Aurangzeb thanked God for the decision and said that PML-N's lawyers had gone to court to "challenge the prime minister's steps [to spread] state terrorism". She accused NAB of displaying "hooliganism" and said that PML-N workers, who had gathered near the PML-N leader's house, were beaten up. "This is state terrorism," she declared and added that the "inefficient and incapable" government was pulling a "media stunt" to mislead the people. "NAB had conducted an illegal raid on the directions of the prime minister," she claimed. "Despite a discussion yesterday, NAB's team, after conspiring with the government, returned today." Aurangzeb said that NAB had gone to courtroom number five today and submitted an application for Hamza's arrest. However, this application was rejected by a NAB court, she claimed, further claiming that the bureau was informed that an LHC order exists in this regard. She further said that Shahzad Akbar, the prime minister's aide, remained in contact with the director general of NAB's Lahore chapter and "passed on" the premier's instructions to the anti-graft watchdog. She demanded that a "forensic test" of Akbar's phone should be conducted. While addressing a press conference earlier, Information Minister Fawad Chaudhry regretted that Hamza had "locked himself in the basement" and "is using women and children as shields". Referring to the standoff in Model Town and drawing parallels with the 2014 Model Town tragedy, he said the nature of operations conducted by Punjab police in the PML-N's tenure were now "in front of everyone to see". "Politics is being used as a shield to hide their corruption," Chaudhry alleged. "On one hand, they say they do not mind accountability, but when they are being held accountable they are in hiding." The information minister noted that Hamza's cousins, Hassan and Hussain Nawaz, the two sons of former prime minister Nawaz Sharif, had also said they would give evidence in court regarding the cases against them. "Now they are saying they are UK citizens and Pakistan's laws do not apply to them," he said. "I think once he [Hamza] steps out, he will say he is a Cuban citizen [and] that he was given the citizenship by Che Guevara himself, [because] he was a revolutionary at the time." Chaudhry said that the matter of Hamza's arrest was between the PML-N leader and NAB. However, the minister said that, ideally, Hamza should turn himself in. 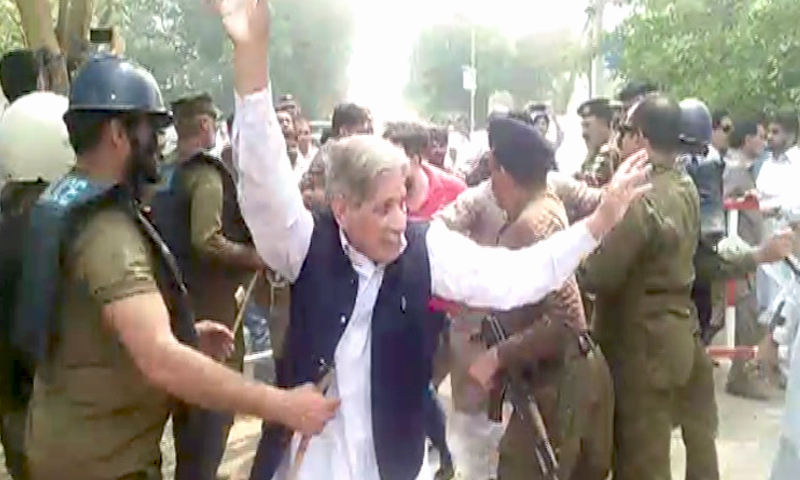 He said NAB could use force to enter the Shahbaz family house and arrest him but right now, PML-N workers were displaying aggressive behaviour against the accountability bureau. "If NAB enters his house, the media will show that [in a negative light] and this is what I have been telling you – we are not like the previous government," the minister said. "Right now, we need to differentiate between politics and crime," Chaudhry said adding: "It is very important for Pakistan that we do not allow crime to be shielded by politics. If our media and opinion makers do not draw a line between politics and crime, it would ultimately damage Pakistan." In an official statement released by NAB, the bureau had said that the measures being taken to arrest Hamza Shahbaz were within the bounds of law. "Hamza Shahbaz is hereby informed that he should not take the law in his own hands and to surrender to the national institution," the NAB release had said. According to NAB, the arrest warrants for Hamza Shahbaz were "legal and actionable". "PML-N workers are tensening [sic] the environment on the party leadership's orders," the release said. A police contingent and anti-riot force had been deployed to manage the situation. According to DawnNewsTV, police had blocked all the roads leading to Hamza's residence. 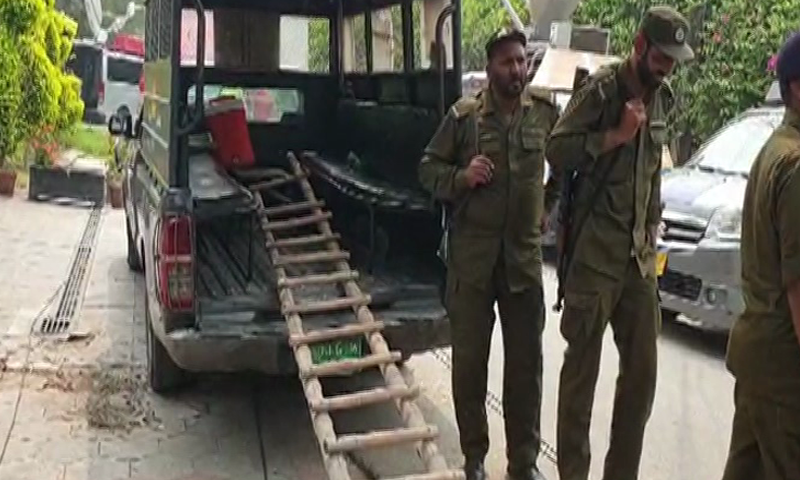 A team of Rangers personnel had also arrived in Model Town. Dozens of PML-N workers were also seen trying to get through barriers placed by police in order to reach Hamza's house and clashing with police in the process. DawnNewsTV reported that one worker fainted during the clashes and had been shifted to a hospital. 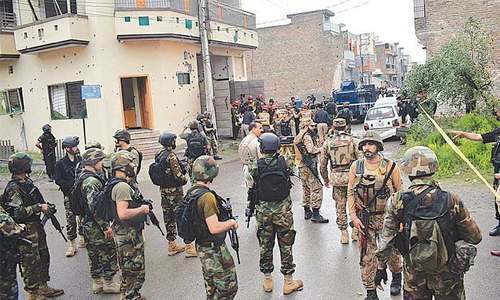 Punjab Chief Minister's Spokesman Dr Shahbaz Gill, while speaking to DawnNewsTV, distanced his government from the raid, saying this was "an independent operation" undertaken by NAB. He added that, personally, he believed that Hamza should have surrendered yesterday. 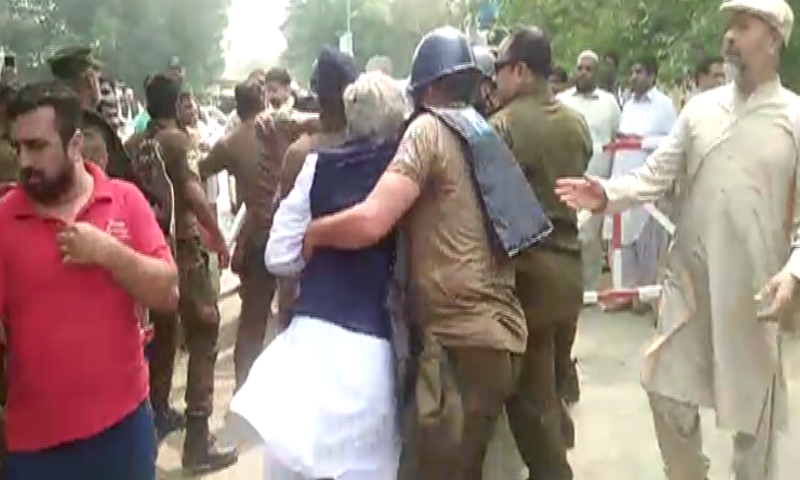 Gill said police had been given authority to use force while staying within the ambit of the law. He said that no law would be violated, adding that the government did not believe in political victimisation. PML-N spokesperson Marriyum Aurangzeb while speaking to media said that "state terrorism" was taking place on behalf of the prime minister. She said that an LHC order states that NAB has to give a ten-day notice for the arrest of Hamza. She added that NAB has gone to the Supreme Court against this order. However, the SC has not yet given any decision on this nor had they set aside the LHC order. Additionally, Aurangzeb said that the order that NAB was interpreting, as per their motive, regarding sufficient evidence was with regards to a different order. PML-N leader Muhammad Zubair, while speaking to DawnNewsTV, said that when the NAB team had arrived yesterday, Hamza had told them that a Lahore High Court order "clearly stated" that if NAB were to arrest Hamza "they would notify him ten days prior to arrest". Zubair said that if NAB believes they have legal grounds to execute the arrest despite the court's order, they should have gone to the high court yesterday and clarified it. He said the situation could have been easily resolved if this was done and a confrontation would not have taken place today. NAB had on Friday raided the residence to arrest Hamza on charges of money laundering and income beyond means, but returned after facing resistance from his security guards and party workers. The situation worsened with each side blaming the other for harassment. 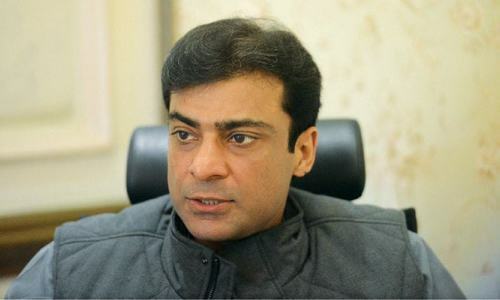 NAB filed an application with police to register an FIR against Hamza’s guards for interference in the state’s functions and requested the interior ministry to put his name on the no-fly list, while the latter also approached police to register a report against the raiding team of NAB. NAB in a press release issued after the incident had said that its Lahore team, armed with arrest warrants for Hamza, had raided the residence to take him into custody in the assets beyond means case and a money laundering case. The press release noted that the Supreme Court has made it very clear that NAB did not need to inform suspects prior to their arrest. However, while addressing a press conference following the incident, Hamza showed a document that he described as a high court order. 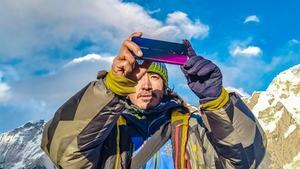 "I have a court order saying that I will be informed 10 days prior to arrest," he had said, adding that the court told him he would be given an opportunity to make a case for obtaining bail as well. The NAB press release alleged that Hamza's guards had beaten members of the NAB team, tore their clothes, and threatened their lives. The NAB statement added: "Therefore, there has been a clear violation of the law by Hamza Shahbaz." "Those who interfere in NAB's legal action and the operations of the state will be proceeded against as per the law," the statement added. The PML-N was quick to denounce NAB's version as "a complete lie, contrary to reality and an effort to hide its [NAB's] own sins" in a statement released by the party's media cell. PML-N had strongly condemned NAB's "illegal and immoral step". The statement further said that the party was in contact with legal experts and would decide its future strategy in light of the latter's advice. So weak system. Looters are the bosses. After removing Mian Shabaz Sharif's name from ECL all this is nothing but an eyewash for commoners. NRO has already been given to PML-N and PPP by those who gives NROs at their own discretion and Yes it is not IK because it is not in his hands. State Institutions have always been used aa Power for Harrassment... A wrong is wrong not matter who practices. Each and every family member of of the Shariff family have looted the country and do not want to be arrested and face the judiciary. Catch & jail these looters. Its shame that they are playing with law & authority. @Hafeez, That is PML N & PPP policy to appoint most corrupt people at high ranks so that if they are arrested they can say it is political victimization. Finish the job this time! A state institution is used against the political opponents. The main target is the leadership of Punjab. @Hafeez, Humza, your time is up, resist the state, face direct consequences. Arrest all his guards. @rashid, agree. Use force if necessary. Deadly force, if needed. I am from pallandri District Sudhnuti Azad Kashmir Pakistan. I am a political activist and connect with media(Print,electronics and social media) to know the current situation what is going on the world, particularly in our disputed state of Jammu and Kashmir . Moreover I want to represent my state through political activity as a welfare, dignity and free state.We want social and economical justice across the world. so I am very thankful to Dawn news which provides me an opportunity to raise up the voices for social justice. @Hafeez, An MPA has challenged the State and Government what have things come to . Why double standard as Biggest looter, and the most corrupt man in Pakistan that is Zardari could not be handcuffed yet. @shuaib, Incompetent and fools are people like you, who take side of the looters of this nation. The real issue which you are claiming to be inflation and the crippling economy is indeed because of the mis-deeds of the PPP and PML. Is the police team there to support or oppose NAB personnel. Resisting arrest is a crime. Let's see what bigger drama Zardari will try to create. Send rangers and army to back up NAB to arrest him. @shuaib, are you even a Pakistani, or not? NAB is doing a great job..keep it up! Shariff's are turning out to be thugs. Law should prevail without any discrimination and Mr Haza Shabaz should be arrested without any hesitation if all due legal proceedings are in place. The Supreme Court had issued a decision on 28-3-2019 that NAB can arrest any person anytime without notice. Zardari the Father of corruption is not yet handcuffed and no looted/plundered material yet recovered. Why Hamza Sharif is afraid of being arrested if he thinks he is innocent and answer all questions with evidence? NAB want the evidence of assets beyond income and reached to over Rs 411 millions? Only guilty try various tricks to avoid arrest, and Sharif family is no exception! (Gharib Awam ki Awaz). This is simply playing to the gallery ....... either they should do what everyone knows should be done......or just drop the whole exercise. No one should be allowed to take law in one's own hands. If he thinks NAB is wrong, he should approach an appropriate forum. In the meantime, he must surrender himself to NAB. @shuaib, so u mean the looters should be left aside who made this country a defaulter? @Ali, IF what you say is true, the NAB chair should be replaced. They should look for Shahbaz in some caves in the mountains..this is sort of tactic to hide from the law, runs in the family. Remember, Captain Safdar, sitting in some cave, with a single rifle with and aid, trying to evade his arrest?? @shuaib, So, by your logic, if the government lets them all get away, releases NS and ends all the prosecutions, the economy will start thriving and prices will come down? Appears just a friendly fight. NAB is an institution under Pakistani laws, So why so much panic if someone is free from corruption and he feels he did not do any malpractice in past he must face and answered the question to get clearance, no need to politicize the matter to misguide the general public. Well done NAB. When criminals don't cooperate, arrest them. No one is above the law. If these so called 'politicians' have nothing to hide then they should have no fear of cooperating with the authorities. Should send commando to get him arrested just like its done for hijackers. The government must focus on the plight of people and sliding economy, this is preposterous. Raiding houses is a wrong precedent. Thos advocating it must realize this cannot be made a norm. Hyperactive NAB is hunting down all and sundry therefore people have stopped investing in the country and many businesses have shut down already. Seems like the government wants to reach the dead end sooner than we thought earlier. @fairplay, so someone talking against PTI is not Pakistani? Who are you to give out these certificates of nationality? Just curious, because even before anyone has been to court, it seems most have decided the verdict? @Kamal Khan , let elect zardarni and nawaz again so there is more curruption and more buisinesses. If he has not done anything wrong why is he then hiding? Prince of Model Town is above law in this Islamic republic !!!!! @shuaib, very poor counter arguments as usual by NS supporters. You need to know that charges against Sharif clan are extraordinarily huge as compared to what you attribute to IK. Pakistani corrupt system. Whats joke of a country you are. Here i Europe the police would have gone in and arrested the person a long time ago. He should surrender to.the law ! If u r innocent then u should not worry and u should not challenge state institutions. Nip the evil of corruption, nepotism and cronyism in the bud no matter where it stems from? Few families are much stronger than all state institution in Pakistan. Our judicial system and jails are not designed for them. Hamza’s resistance just proves that Sharif Family along with other political “elites” are the unruly people with no respect for the law... they must be dealt with strictly to set a clear example for others like them!!! @Mazhar.A.Khan, yes only online, because you wrote the opposite a few days ago. @shuaib, this mess was created by the incompetent PMLN government. The chickens have cone.home to.roost for the PMLN. From past several years, NAB has become instrument to harass political opponents. This politicization of this institute is not good for the country. Not sure why after arrest, charges are not immediately laid and trial begun. These long delays help no one and create doubt. Better to punish those already arrested and deal with the rest later. Why doesn't Hamza stop creating drama and let the NAB officials do their job. He is wasting public money and time. @shuaib, first of all NAB is an independent organisation. Should we let suspects and criminals roam freely because of the economic situation of the country. I don't see the logic in your comment at all. Will he also be let off on medical grounds. PM and his cabinet have failed. Country has seen worst inflation. Government is in panic after PPP's warning to march to Islamabad. They wan't to arrest PML-N leadership to weaken the opposition. Simply, AAZ, NS, SS and his family members think they are untouchable and above any law. Teach them that law should be same for all, no matter, who they are or what is their political status in the society. Otherwise, law will be just a joke and only applicable for poor people. This is a test case for PTI government! ( Gharib Awam ki Awaz). Hamza Shareef thinks he is above the law. If NAB is independent. Why does IM give statements like this. There can't be one rule in democracy. IK have to do his job with these people of politicians , the same type of people which he included in his party to win elections. All will go in the vain. Nothing will happen to powerful corrupts. @Iqbal Hadi Zaidi, Agreed. In order to prevent such dramatic scenes government and NAB should arrest all accused corrupt people at once. Release them one by one provided they are innocents or money returned to the treasury. I sincerely wish law was so efficient, accommodative and flexible for commoners as well. Those powerful sources also known as "System" who created PML-N will not let anything happen to it. Such actions bring bad name to the government. Imran Khan must think and act aggressively against the looters soon. More time to looters will help them to make fool the innocent people to get sympathies. @shuaib, how else would a government fix the economy, you can have all the money you want but if plundering and corruption continues nothing is fixed. @Jimmy, That really doesn't matter if my comments don't make sense to you. This is called third world politics. I am sure any PPP man would have not acted like these coward so called Loins. today hamza must have felt what the poor model town victims felt when police were at their doorstep. It is becoming obvious to people of Pakistan where the problem exists in the 'system'?? @Qasim, Your words speak volumes about corrupt mafia & that is the most unfortunate part of our society. Corrupts can mold the law whenever they wish to do so. Simply, AAZ, NS, SS and his family members believe they are untouchable and above any law. Teach them that law should be same for all, no matter, who they are or what is their political status in the society. Otherwise, law will not be taken seriously and will only be applicable for poor people. This is a test case for PTI government and investigative institutions. (Gharib Awam ki Awaz). Entire country is in shambles, economy is in doldrums, foreign policy issues are on the horizon but this is the circus we see our leaders from both sides indulging into. Its shameful! Once Albert Einstein said 'Insanity is repeating same process over and over again and expect different result'. This is the main cause of problems of Pakistan. Such dramas would not benefit Pakistan and government as well. @Pakistan First, Nawaz Sharif and his ilk are not common people. @Awan, if you have been sleeping for the past 20 years it's time to wake up. Nawaz and his family is the leadership of Punjab. In this way no accountability will be done. Ultimately all looters and corrupt will be free and come into power in next elections by poor, uncouth people. This democratic system is not working. And they call themselves "sher". Pitiful. Rich & powerful won today. Why the court did not release such order for the poor guards of Shahbaz? Perhaps they could not bear the lawyer's expenses. Yeah right. @shuaib, NS thief’s trolls have no space here. @shuaib, It is not. Please help Pakistan get free from Chaudaris and Waderas who have been controlling Pakistani AWAM for too long and robbing them at the same time. I left Pakistan because I was fade-up with corruption. I am so glad that I did. Please get yourself free from the clutches of these jagirdars or else you will always be slave of them and singing "Sohni Dharti...." which suits them well. A black day today. Rich and powerful has again won in Pakistan. They have the writ only for implimentation on poor and powerless. @shuaib, Noras like you are real disgrace to this country. PML and Zardaris are responsible for all this mess. Higher courts seems to defend the powerful corrupts in one way or another. Can these courts do the same for down troddens? What a coincidence: as soon as there is a an outrage from the public over crushing inflation, govt starts these distractive measures. People own their own focus that they need to have -education and knowledge- to critically evaluate the situation whether Hamza is clean as his family always claim. What were the stages of increment in their wealth by year. Low level of Education and Motivation and Despondency was the gift of the Zardari's and Sharif's, millions left Pakistan to seek their fortunes abroad. Its so painful to see the process of accountability drag. this smacks of political opportunism. Why is Lahore High Court or for that matter any other court of Law retarding the normal proceedings - in other words involving themselves in politics. @Miraaj, How's IK accountable for BRT? If that's your logic, Nawaz should be held accountable for Shehbaz's wrongdoings. @danish, "This democratic system is not working". Agreed.That's the crux of the matter. This system is not suitable for our country. Justice will never prevail under this system, regardless of who the PM is. Under this so-called "democracy", power is shared amongst all the lawmakers, and unfortunately most of them are in fact law breakers not lawmakers. System needs to change. Dollar is reaching 148 and PTI is using state power to suppress political opponents. Why not energies are focus on development rather than show off power? Will some knowledgeable person kindly inform under what law a court can grant 10 days’ notice period before making an arrest to someone wanted for investigation with solid roof of high embezzlement, money laundering etc by a court of law. Hamza claims that Lahore High Court has granted him immunity for arrest without a prior 10 days’ notice. What law is this? Chaotic system delivers nothing but a green pass for corruption. Extremely poor performance of NAB. They arrested many politicians and their allies. Most of them are free from cases. It became our habit to get loans/aid from IMF/World bank and other friendly countries and do corruption and send money to overseas as safe heaven. @shuaib, Absoulety ridiculous assessment. As we have not seen systems working, these things will prevail. If this is not obstruction of justice, then tell me what is? how poor public will get justice from this justice system which have double standard -provide 24/7 justice to influential and rich class. This justice system is loosing its confidence for poor/general public. NAB id totally impotent. Instead of begging him to surrender, they should have just stormed in as soon as they got there,arrested him and anybody else who came in the way, put them in handcuffs, and take them away.They had the arrest warrant and had the backing of rangers and police. The writ of the state has has all but disappeared. @shuaib, and how exactly did we get here? inflation didn't happen by itself. Billo rani, diseased lions both of these parties are the cause of this near economic collapse. Yes IK is trying to fix these issues, but the sharifs and the bhutto's both need to loose their necks for the damage done. Good to see atleast Court are protecting the rights of rich and influential.. inshahAllah over time they will have the capacity to protect the rights of poor and weak too. And Monday court will give him a bail. This is why at the end SC has to involve to move cases to Islamabad I wish action should be taken against those judges who are helping these criminals. I give my best wishes to PM Khan but so far I don't see these big names will be staying in jail for long period of time unless there will be military action against these criminals. If this is the only way then I would say do it. @Citizen, PTI is doing both, fixing the bankrupt economy it inherited from PLM-N and holding people accountable for corruption. Pakistani's like you need to support the implementation of the rule of law. @Awan, No, a state institution is actually doing its job against corruption. The main target is the corrupt. The innocent shouldn't fear the rule of law. PPP is holding the government together. What's stopping them from breaking it. This is all they have been doing since coming to power. Arresting people or putting them on the ECL while the economy is kicking its legs in death throes.